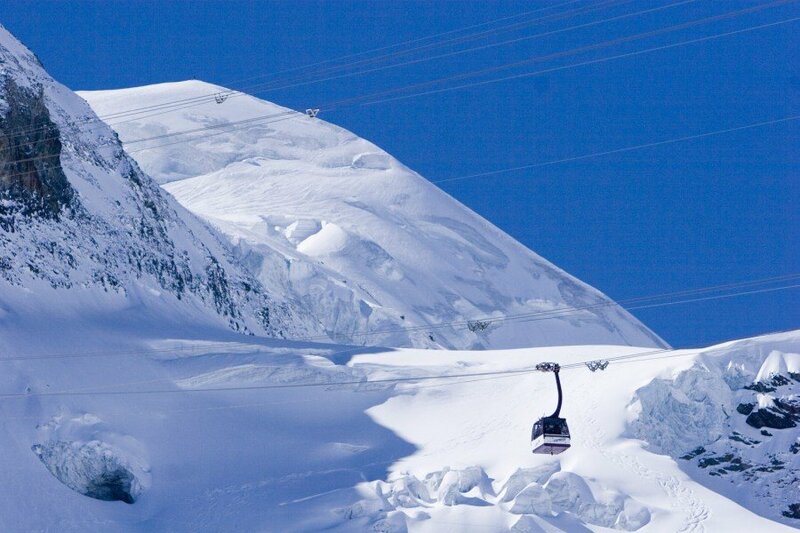 Elevated between 4865 ft and 11811 ft, the Ski Resort is among the 3 highest elevated Ski Resorts in Switzerland. The vertical drop from summit to base is 6946 ft. The average difference in altitude between base and summit of Ski Resorts in Switzerland is 2890 ft. Most runs are therefore relatively long. 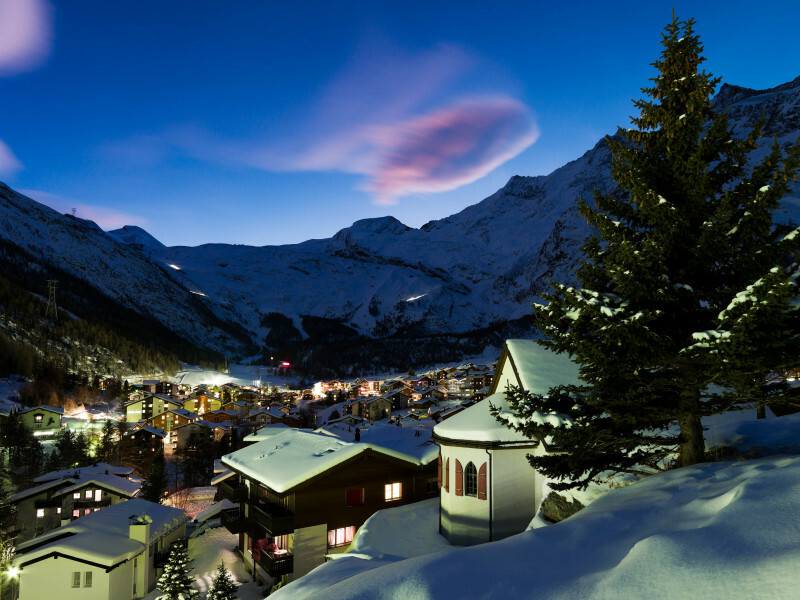 Saas Fee is among the 15 best rated Ski Resorts in Switzerland. 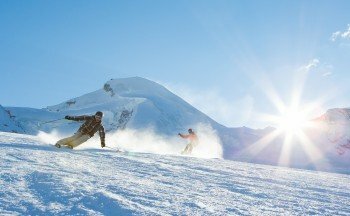 It is among the 10 most family-friendly ski Resorts in the Valais. Season starts on Jul 14 and ends on Apr 28 (288 days). Average season duration in Switzerland is 112 days. Average snow depth during the season (Jul 14 to Apr 28) is 85 " at summit elevation and 13 " at base elevation. Snow coverage is usually best during March, offering an average snow depth of 134 " at summit elevation and 31 " at the base. Therefore Saas Fee is among the 3 ski Resorts with best snow conditions in Switzerland. 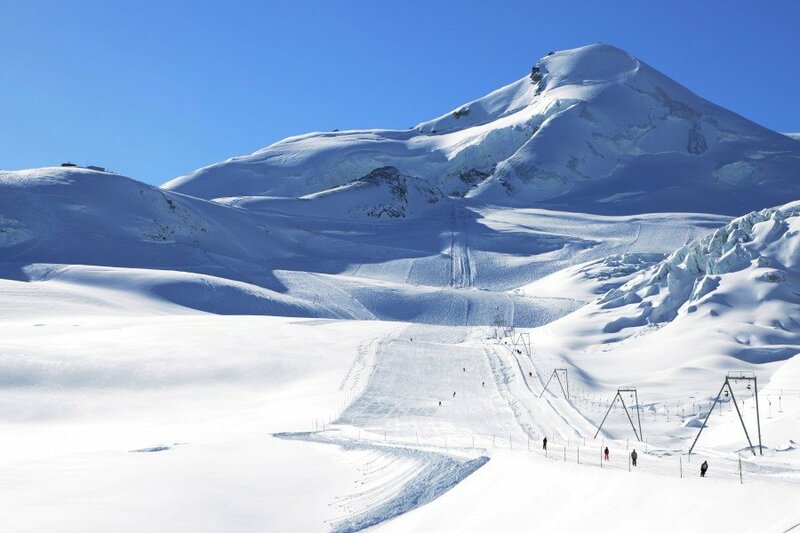 Saas Fee features 170 sunny days on average per season. The average for all ski Resorts in Switzerland is 150 sunny days. August is the sunniest month with an average of 27 sunny days. 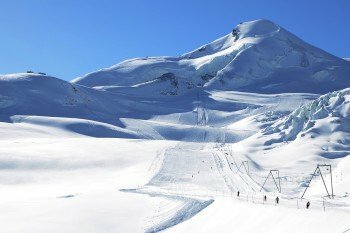 Offering 62 miles of slopes and terrain, Saas Fee is among the 10 largest Ski Resorts in the Valais. Saas-Fee, the 'Alpine Pearl' is located in the middle of the impressive mountain and glacier world, and surrounded by 18 four-thousand meter peaks. With 100 kilometers (93 miles) of trails and 24 lifts. it invites to have a blast on your skis. Its elevation and the glacier area guarantee best snow conditions for almost 10 months a year. It is the rare combination of 300 sunny days and countless inches of snow each year that makes this one a skier's dream. If you are looking for varied slopes and incredible long runs, this is your spot. Altogether, this is a holiday spot par excellence for winter enthusiasts of every age and kind. There are plenty of runs where beginners can cruise along comfortably at the base station or by Alpine Express and chairlift Morenia. As soon as you gain more knowledge you should definitely check out the more challenging trails that even feature a drop of 3,600 meter (11,811 feet). Challenging yourself to ski outside of your comfort zone is not only a great way to improve, it is also how you discover the treasure chest of the mountain. Intermediate skiers usually love these high-altitude runs as well. Mogul slopes are in the area of Spielboden. Saas-Fee has the world cup mountain Plattjen that will even please the most courageous skier and snowboarder with being extremely steep. It is also worth hitting the popular trail that starts in Allalin and takes you to Saas-Fee. On your way to the base you will overcome 1800 height meters (5905 feet). Even riding up to the starting point can be intimidating: The Alpin Express and the Panorama-Felskinnbahn take you from Saas-Fee up to the glaciers that top out at 3,000 meters (9,842 feet) above sea level. From there you can grab Metro Alpin, the world's highest underground tram, in order to get to Mittelallalin. Take a second and enjoy the breathtaking panorama, on a clear day you can even see Milan. In the summer skiing season you can still discover 20 kilometers (12.4 miles) of trails that will keep you busy for several days and are perfect for every ability and level. Freeriders have five off-pistes options. If you don't feel like doing it on your own, you can book a freeride tour in the mountain guide offices that you'll find everywhere in the valley. Freestylers will get their money's worth as well. Saas-Fee even has two terrain parks to offer located throughout the area. Those are stuffed with various features of all ability levels. The terrain park Morenia in Saas-Fee is right above the top station that shares its name. There are endless events during the winter season. And the last one is especially great for the summer time. With super pipe, three kicker lines, rails and boxes, it has everything a freestyler's heart can desire. Look for Popcorn! in Längfluh at 2,870 meters (9,416 feet) above sea level. Plaza, a snow bar with sun deck and beach chairs invites for a rest right in the middle of the beautiful glacier world. Furthermore, you should for sure pay a visit to the revolving restaurant threes!xty at Allalin. 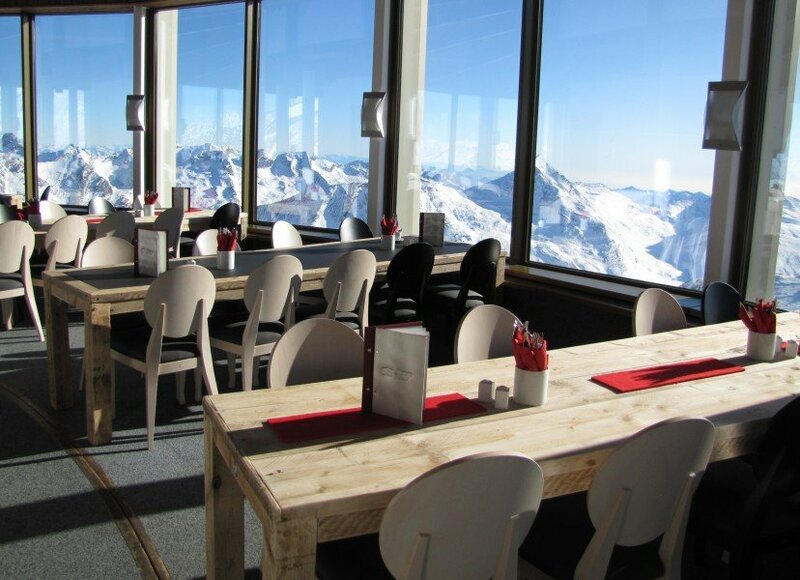 It's the world's highest revolving restaurant and just perfect to enjoy the view. Advanced skier should speed down the steep trail at the World cup mountain Plattjen. Thanks to the spectacular panorama that you'll have skiing down the glacier slopes. Those who enjoy other winter sport activities are on cloud nine here in Saas valley. There are 60 kilometers (37 miles) of winter hiking trails, 54 kilometers (33.5 miles) of snow shoe trails and 32 kilometers (19.8 miles) of cross-country trails to discover. Look for the ice rink where you can actually go ice skating or you could do some curling. 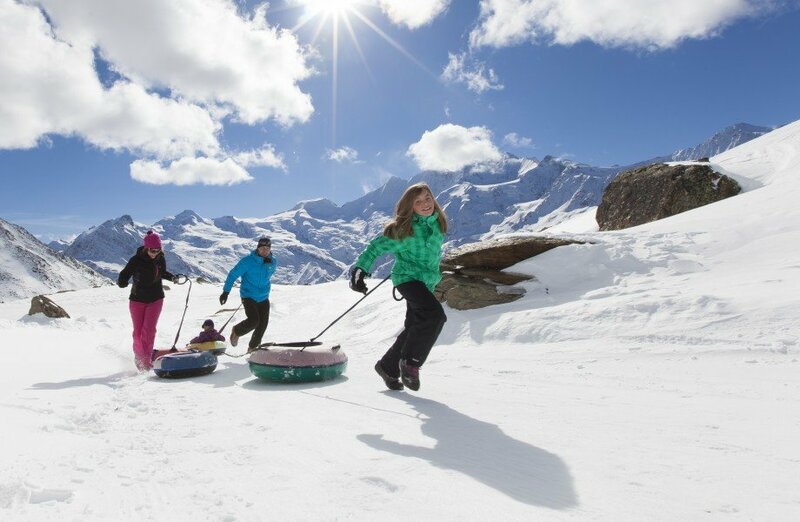 A blast for the whole family is to feel the thrill of the speed while speeding down the tobogganing runs in the valley. Of course you can also 'shop till you drop' and enjoy the wide gastronomic offer. Culture enthusiasts could visit the local museum or galleries. If you want to relax your sore muscles after a day of skiing, you can use the wide wellness options or dive into the world of the swimming pool Aqua Allalin. The entertainment program also includes torch light walks, village walks or brewing your own beer. 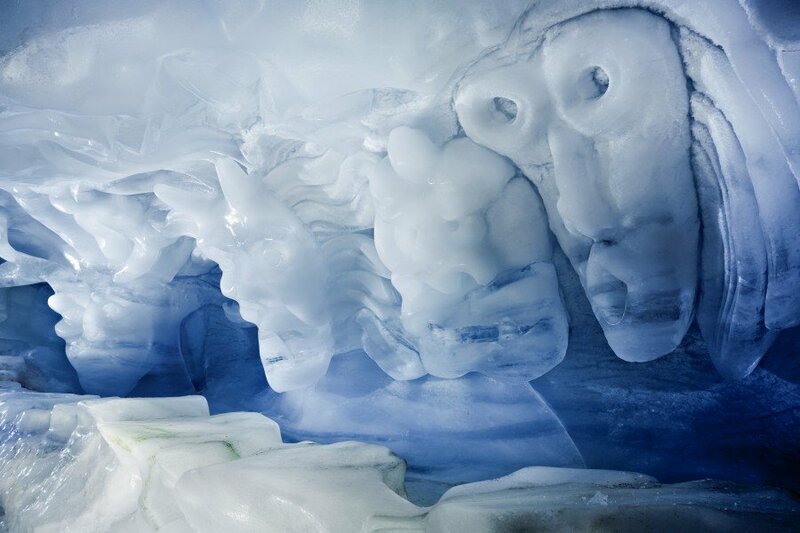 You can also visit the world's largest ice grotto. Visitors find out all the secrets of glaciers and experience these in a whole other way. The extremely huge ice grotto surely leaves nobody unimpressed! 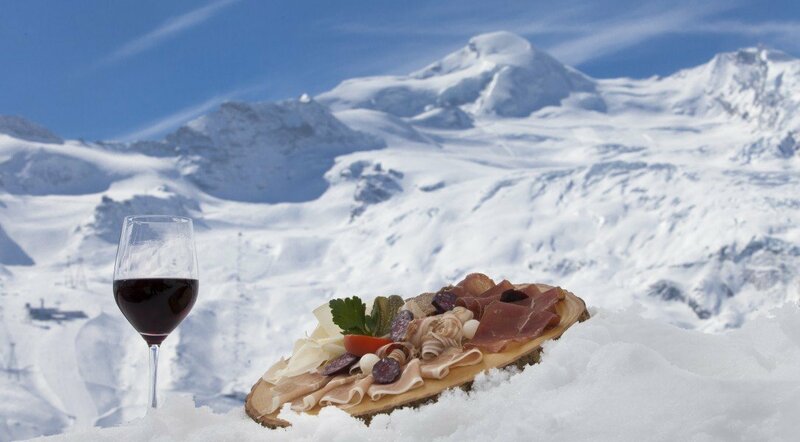 After a successful day on the slopes you can end your ski day in one of the 19 pubs and bars. The Popcorn! is one of the hot spots for locals and seasonnaires in Saas-Fee. It is well-known among Apres-ski fans for legendary parties and events. Boasting 17 mid-mountain restaurants, Saas valley is a great spot for foodies as well. 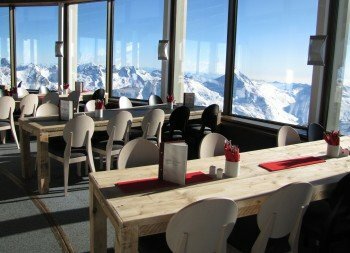 At the world's highest revolving restaurant at Mittelallalin you have the chance to sit back in a fine restaurant treat yourself to some excellent food and enjoy the fantastic view. Restaurant threes!xty needs one hour to rotate 360 degrees around itself and leaves you feeling like you're right in the middle of the Saasser mountain world. 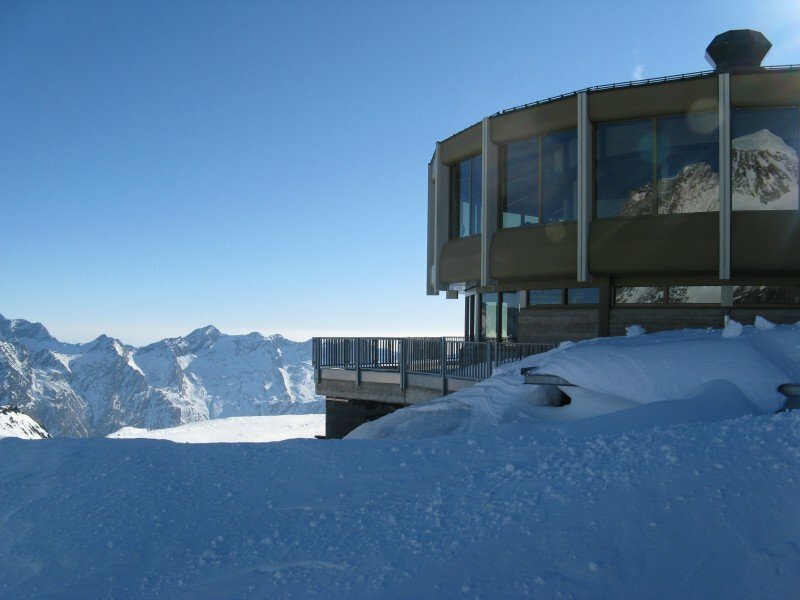 The modern restaurant, situated 3,500 meters (11,482 feet) above sea level, serves dishes from all over the world. In addition, there are tons of mountain huts beckoning you in for a break where you can recharge and enjoy local food. Coming from the North, take A6 from Bern to Spiez and pass Lötschberg. From Visp you´ll reach Saastal via Stalden. 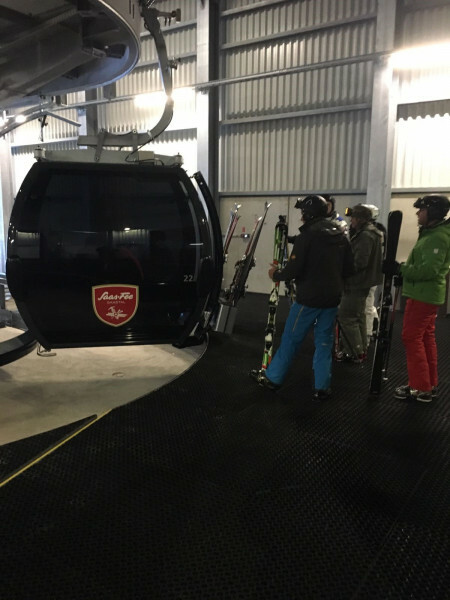 Quick tip: If you want to use the car train at Lötschberg you´ll get reduced tickets at the Saas-Fee/Saastal tourism information. Coming from the East get on B19 and Furka pass road. Furka pass is closed in the winter months that´s why you have to use the Furka car transport. From Visp you have to pass Stalden to get to Saas-Fee. Coming from the South you´ll have to take the Simplon pass road that takes you to Visp. But be aware that this pass is closed in the winter that´s why you have to use the Furka car transport. Coming from the West/Western Switzerland you´ll come from Lausanne and get on the A9 or E27 to Martigny. Vacationers that want to come by train should get out in Visp. From there you can hop in the Postauto (bus) that drives every half an hour to Saas-Fee. The bus station is right in front of the train station. Coming by plane you can fly to Zurich, Genf, Milan or Basel. Public Transportation need about 3 hours from there to Saastal. Does anyone know locations of other activities in Saas Fee. Such as swimming pools, ice rinks, curling, or anything else which will bring a smile to a child's eyes?